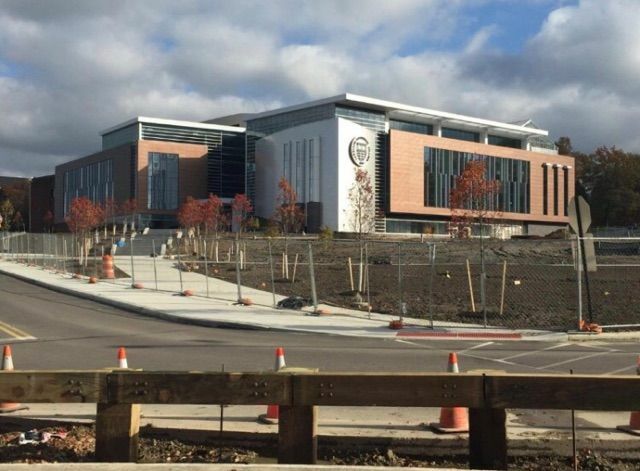 The newest addition to Lakeland Community College is a $65 million renovation and addition to the existing Health Technologies Building. Through an evolving partnership between Lakeland Community College, Gilbane, and the subcontractors working on various projects over the past three years; what started as a $3 million renovation evolved into a large scale addition and renovation. The space will now house room for additional students in the college’s growing health education department, renovated auditoriums, a new wood shop, green roof, and a greenhouse for student use. Of tantamount importance to the project is the objective to ultimately achieve LEED Gold Certification. Through the use of sustainable building materials, integration of green initiatives, and strict waste and water management on the job site throughout construction, Lakeland hopes to add to their portfolio of LEED certified buildings on the campus. Ultimately, through water and energy conservation plans the college hopes to reduce daily operating cost. In addition, by fostering a space saturated in natural light and green initiatives such as a greenhouse, the college hopes to invigorate and foster student learning within the space. The 75,000-square-foot addition is on track to be open for Spring 2018 classes. As the new space is being utilized in the spring, renovations to the current 50,000-square-foot space will commence. While OCP Contractors is accustomed to strictly complying with LEED standards during the construction process, self performing metal panel and stainless steel shingle installation was a new task for the team. In addition, managing a robust scope of work requires detailed coordination, schedule adherence, and a superior workforce. 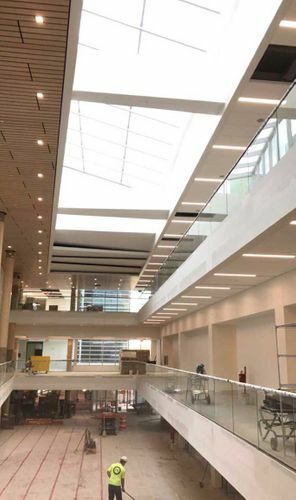 Ultimately, the OCP team has been able to maintain schedule and quality workmanship, in spite of workload, to ensure that the newest LEED addition to the Lakeland Community College campus is completed on-time. The project is expected to be fully completed by summer of 2018, and fully open to a new class of health professional for the 2018 fall semester.